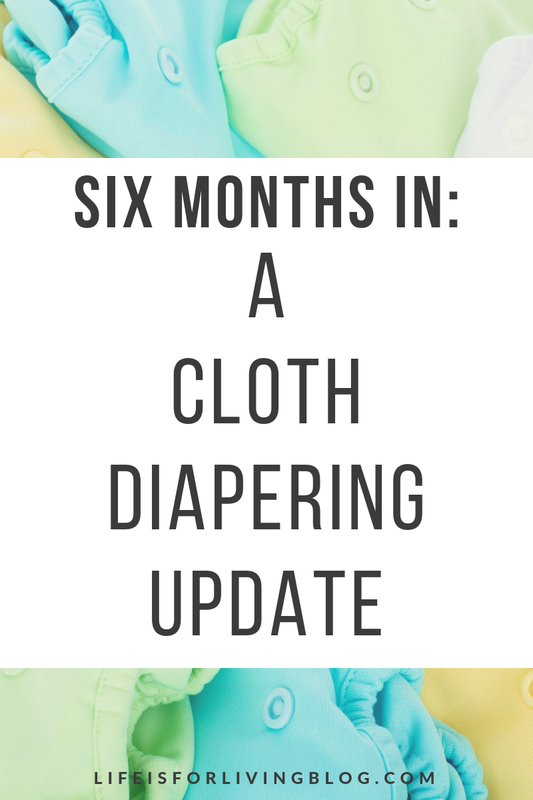 Three months ago, in A Beginner's Guide to Cloth Diapering, I shared a comprehensive overview of our cloth diapering routine. I received good response from that post, so I thought that I'd give an update now that we're six months in and fully immersed into the cloth diapering world. We've learned a few tricks since that post, and, with the introduction of solid foods, we've had to step up our game a bit. I also wanted to make a few "corrections." Get ready for lots of poop talk. In my previous post, I neglected to mention that our super easy washing routine (take poopy diaper off baby, toss directly into diaper pail, dump into washing machine with other diapers) was due to my exclusively breastfeeding. Breastfed baby poop is water soluble, which means it washes away in the washing machine; no pre-wash care is required. However, if a baby is formula-fed or has begun eating solid foods, you'll have to remove the poop before placing the diaper in the washing machine. 1. Hold diaper over toilet and scrape poop out into toilet bowl using a tool, perhaps an old spatula. 2. The ol' Dunk-n-Swish Method: dunk the diaper in the toilet water and swish the poop away. 3. Use disposable, flushable liners like these inside cloth diapers; simply lift the poop out and flush down the toilet. 4. Hold diaper over toilet and, using a spray hose, blast the poop into the bowl. 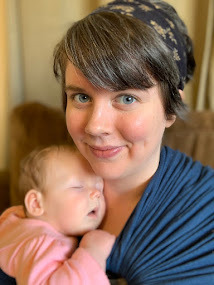 Now that Claire is eating a few solid foods, we've said goodbye to the days of slightly sweet, buttermilk-scented, liquidy-mustard, breastfed-baby poops. You sure can tell when the solids come out for the first time. Boy, oh, boy. With these next-level poops, we've had to select from the above methods. My best friend had great success with the flushable liners (pro tip: she even cut them in half to stretch them further). I was down for this option, but I read a lot online about how they can cause blockages in old or sensitive septic systems. 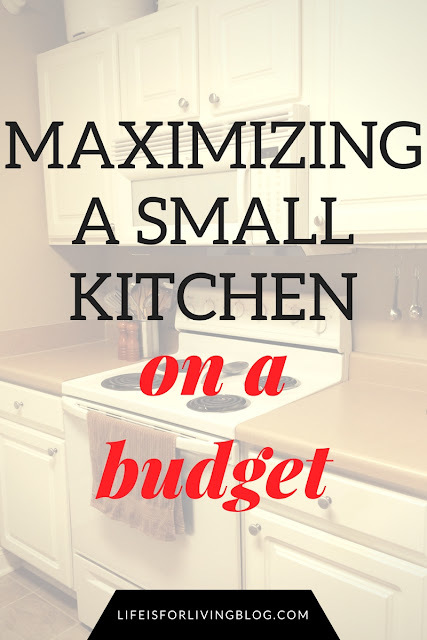 Since we live in a, shall we say, "quirky" 1960's home, I thought it wise to avoid this. Plus, buying liners regularly is an added expense we could do without. We already had this beloved hand-held hose bidet , so we decided to go with option #4, the spray hose method (if you've never used a bidet, let me change your life. Go buy this thing now. You'll thank me later.). 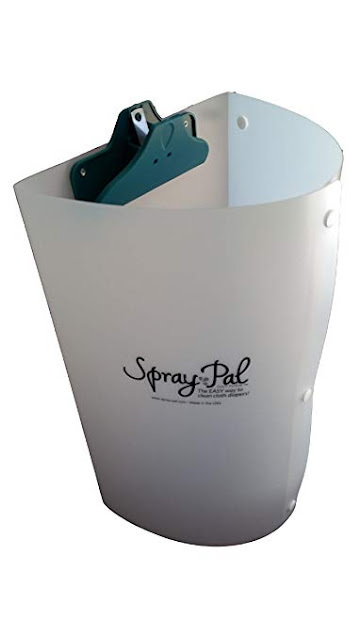 However, not wanting to blast poop onto the walls and ceiling, we thought we'd try the legendary Spray Pal . I'll admit, I thought this thing was ridiculous and unnecessary. I didn't want to waste money on a dumb plastic-wrapped clipboard. But we got it, and the first time I used it, I was all up for risking it with the septic system and trying the flushable liners. ...I'll just say the Spray Pal has a bit of a learning curve. But after a few times, it's no big deal. 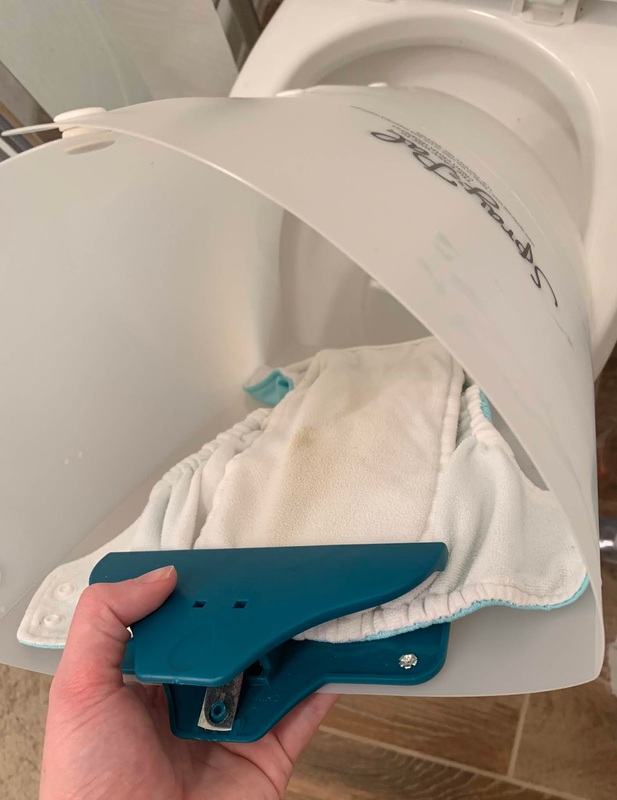 You clip the open dirty diaper inside, use one hand to hold Spray Pal over the toilet bowl, and use the other hand to hold the bidet spray wand to rinse away the poop. Then you unclip the diaper and drop it into the pail with the rest of the dirties. It's not that difficult or disgusting; really, it isn't, once you get the hang of it. And you're not sending anymore poo particles into the air than you do every time you flush your own excrement. The Montessori method recommends setting up the diaper changing station in the bathroom to encourage the development of associations between bodily elimination and the bathroom: the bathroom is where toileting activity is supposed to occur, and this should be instilled in a child from the start. This makes complete sense to me, and I believe it will ease the transition into toilet training when the time comes. Already, Claire is developing this connection every time we go into the bathroom to clean her up. Also, doesn't it make sense to handle a tiny person's urine and feces in the bathroom (where everyone else's urine and feces goes), rather than a bedroom?! Plus, the sink is right there for convenient hand-washing, and the toilet is right there for solid waste disposal and diaper rinsing. Aside from space limitations in small bathrooms, I really don't understand why this isn't the standard. You can see from the photo that our changing table placement renders half of the sink vanity unusable, but we weren't really using that storage space anyway, and it's only temporary. 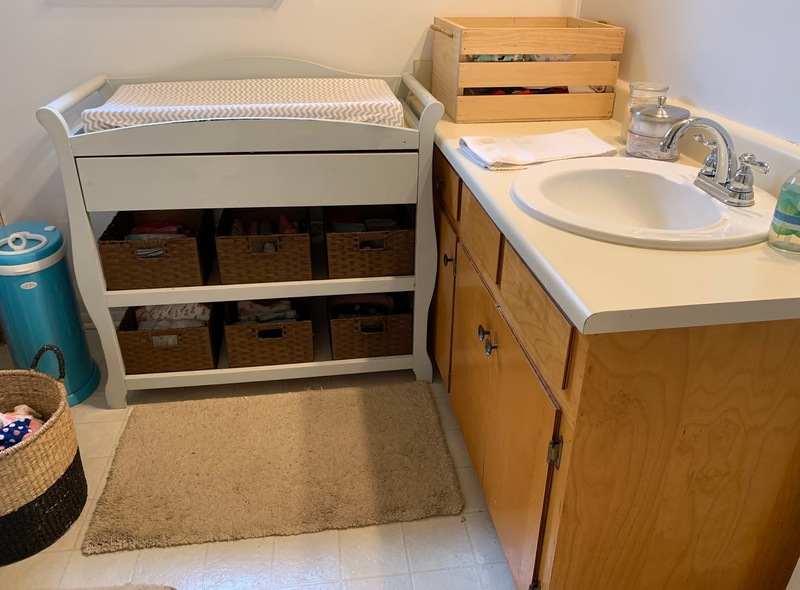 Having the changing table near the toilet and sink is totally worth it! I learned in our Cloth Diapering 101 class that the best type of washing machine to use for cloth diapers is the "old-fashioned" kind with an agitator. Thankfully, this is what we have (see image above). This washing machine and Ecos Free and Clear laundry detergent have worked excellently for cleaning our diapers. The only bad laundering experience we've had occurred while staying with family. 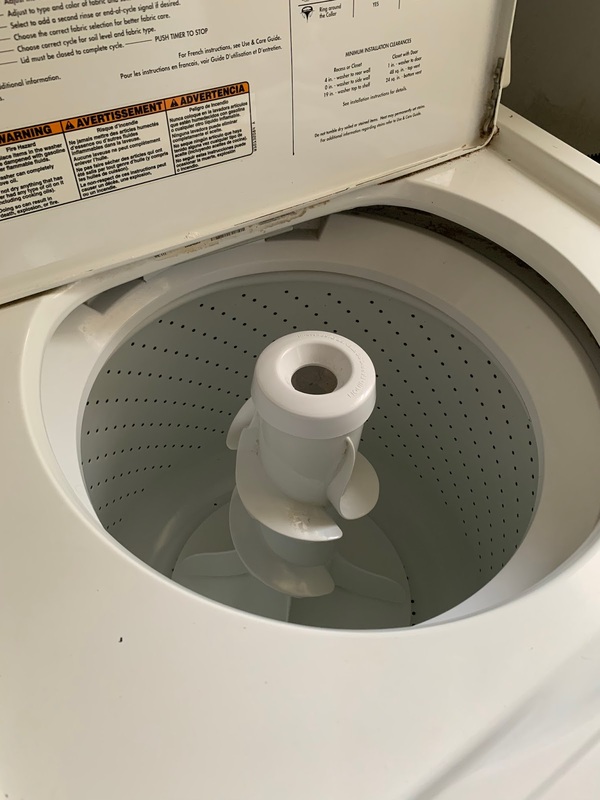 We washed a load of dirty diapers in my mother-in-law's newer model front-loader washing machine. The diapers did not get clean. Fresh out of the dryer, they reeked of ammonia, and they showed poop stains for the first time ever. So, if you are using a newer model without an agitator, cloth diapering may not be the wonderful experience I've described. Detergent build-up and/or ammonia build-up may happen, and this can cause irritation on your baby's sensitive skin. Now, this might not be the case with all front-loaders, but I just want to mention it. If you've tried cloth and had problems with diaper rash, your washing machine may be to blame. If you don't want to downgrade your washing machine, don't give up on cloth just yet. There is also the option of using a laundry service. I have no personal experience with them, but I do know that lots of parents love them. Just Google "cloth diaper laundry service near me" to see what's available in your area. Also, if you have experienced build-up or staining, you can "reset" your diapers by sunning them outdoors after a wash. Sunlight has a natural bleaching effect that can drastically clean up your stained diapers. I haven't done this myself yet, but I've heard that it works wonders. In my previous diapering post, I really sang the praises of the Thirsties One-Size All-in-One . A reader asked if I'd tried any other cloth diapers besides Thirsties, and I thought I'd answer that here. Yes, I have now tried Thirsties, Happy Endings, bumGenius, Best Bottom, and FuzziBunz. After all this experimentation, I still rank Thirsties #1, waaaay above the others. 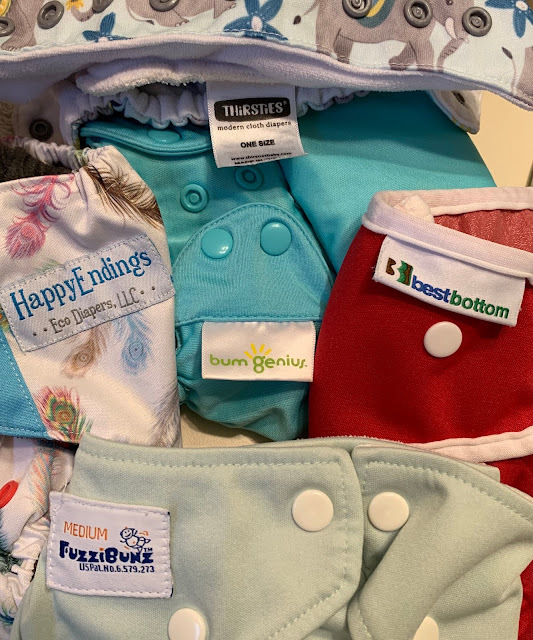 My second favorite has been Happy Endings (whom I was VERY pleased to discover makes cloth diapers for teens and adults as well! This has been a major concern of mine after working for years as a nurse in long-term care.). We really like the custom fit that Happy Endings provides; they are very secure without being too tight, unlike some of the other brands. Next up would be the FuzziBunz pocket diapers. I love the fit and the snap placement, but the absorbency is kinda meh. There's also weird bunching in places. BumGenius is also fine, but the fit is odd around Claire's chunky thighs. My least favorite, by far, is Best Bottom. I really dislike these diapers. The fit is incredibly awkward no matter what snaps I use, and we almost always have leaks. 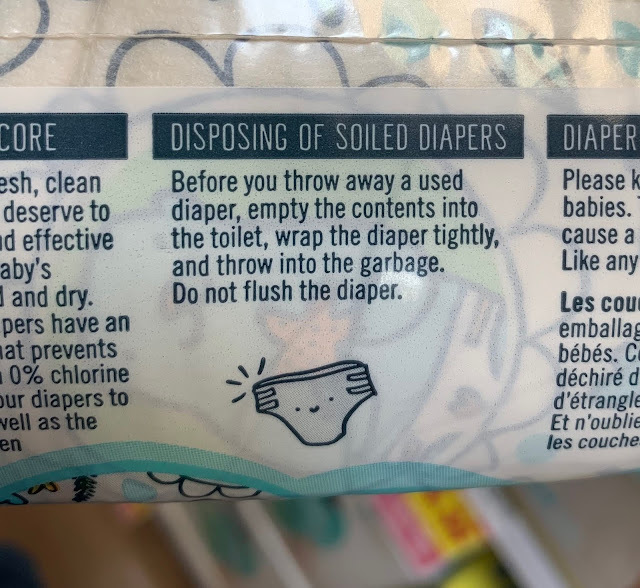 I still use them, but only to procrastinate washing the other diapers when they're all dirty (lol). Perhaps the fit will improve as Claire grows, but for now, I'm not a fan. You just can't beat Thirsties. I'd be the official Thirsties spokeswoman if they'd pay me (but they probably won't, 'cause I'm already doing it for free). Anyway, keep in mind that this is just our experience. My daughter has been chunky, round, and long-legged since day one (9 lb, 6 oz and 22" at birth). Another brand may work better for smaller or differently-proportioned babies. What else can I say (well, a lot, probably, but I'll stop here for now)? We still love cloth diapering, and I know you would too if you gave it a try. It's not any more difficult than disposables (just a couple of laundry loads each week, and unless you're using an old metal tub and a washboard, come on; throwing stuff into a machine and pushing a button is not that hard), it saves you trips to the store, it saves you tons of money, it's better for your baby's sensitive skin, and it does so much to help our planet!